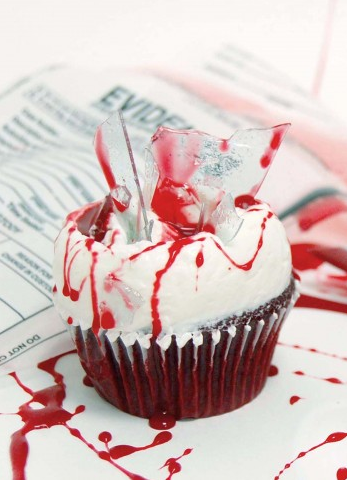 Every serial killer loves to take a trophy, so take a trophy that’s a killer cupcake as well. These unique cupcakes, created by Magnolia Bakery, are the killer cupcake that are so sweet it makes you want to die, just a little. With Season 8 on its way and Dexter’s demise hanging in the balance, there’s no better way to show that you’re a serious fan of America’s favorite serial killer than with the Dexter Red Velvet Cupcakes. These full dozen cupcakes are an edible ode to our favorite serial killer, topped with whipped vanilla icing, edible blood (caramel) and sugar 'glass' shards. Once you order, all cupcakes are shipped frozen to guarantee freshness. So that these cakes look like the freshest kill, the glass shards and blood come on the side so you get the feeling of dressing up your kill before you devour it! The $4 red velvet confection, which pays tribute to Dexter, is available in New York, Los Angeles and Chicago. Order now a dozen of these bloody delicious Dexter cupcakes, by clicking here.